Tell us a bit about yourself and your career. I’ve been a nail tech for six years. Prior to that, I was a piano teacher. I got my nail tech license hoping I could make a little extra money on the side, not knowing my business would explode. 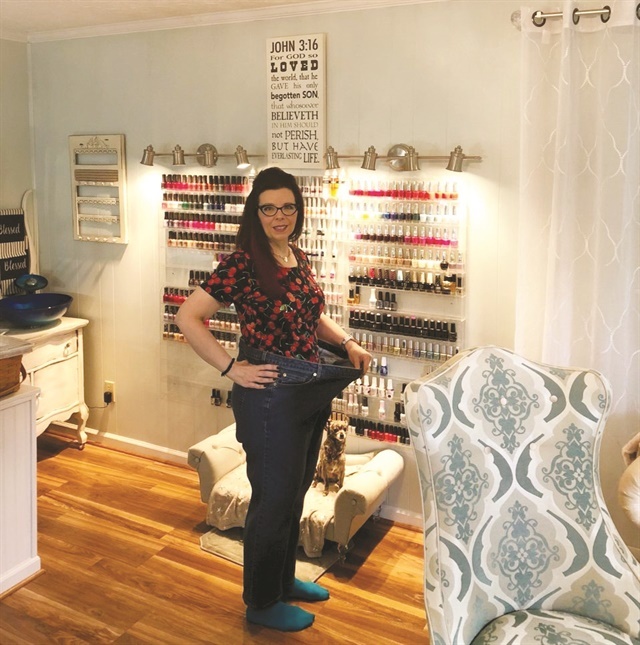 I opened The Mobile Manicurist, and six weeks later, I had already built a full clientele. I quit my job as a music teacher, and I’ve never looked back since then. What are your health challenges and/or goals? I have a very aggressive form of Crohn’s disease. Sometimes it’ll prevent me from eating fresh fruits and vegetables if I’m flaring. I’ve had to get to know my body, and during those times I just have to back off and let myself heal for a bit. One of my goals is to be able to control my disease with my diet only. I’m not there yet, but at one point I had to take 14 different medications. Now, I am down to just one. How long has your health been an issue? I’ve had weight issues my entire life. It wasn’t until I got sick a few years ago with the Crohn’s disease that I knew I needed to change my eating habits. Tell me about your exercise routine. My work schedule is absolutely nuts, so I had to find something that would work with my schedule no matter where I was. I do an online walking class every day, which adds up to me walking about 25 miles per week, sometimes more. I can do that at home, at a hotel, or even from my iPhone. How does your job as a nail tech affect your plan? I have to be very disciplined to see 12 clients a day and stay on track with my eating and my exercise. Pulling such a long day with no breaks means I need to prepare foods and snacks, rather than having fast foods. On some days, it’s tempting to give in, but that would most likely end up making me sick. So it’s best to plan ahead. What has been the most difficult aspect of your healthy lifestyle? The most difficult thing for me besides my health challenges has been sticking to my plan while traveling. Being a mobile nail tech is not easy to start with. It involves a lot of heavy lifting, multiple times in and out of clients’ homes, and eating in my car! I’ve learned to look at my schedule before I do my grocery shopping for the week so I can adequately plan for those days and that helps keep me on track. What’s your advice for other nail techs who want to embark on a healthy lifestyle? Don’t wait! It’s so easy to say we’re too busy to get healthy, but in reality, if we don’t get healthy we won’t be able to stay busy for very long. Step on the scale every day; it makes you accountable. And track everything you put in your mouth. In the end, you’ll get to buy the cute clothes and feel a load lifted, literally!